A unique view of the newest lava flow ocean entry at Kilauea volcano Hawaii Volcanoes National Park. It was extremely hot where I shot this. Also, very windy like it has been all summer on that part of the island. Video of this event from my Nikon D800 coming soon. The tour boat seen is Lava Ocean Tours. Capt Shane and crew. Great tour to go on. Thanks for subscribing and watching. Many more videos to come. Be patient. What I do isn’t always easy. Do not attempt to do what I do. I have 25 years of experience and I know what I’m doing out there. So many things can go wrong for those who don’t understand or can’t recognize the dangers of a volcanic eruption. Stay away and watch my videos instead. Only my camera was in any danger while capturing the video. I guess my infrequent post are getting very infrequent. It only means I’m out doing fun stuff. Finally updated my old Nikon D200 to the incredible new Nikon D800. I’ve shot with the camera since late April. Unfortunately the weather hasn’t been the best in the places I need sunshine. Many shots might have to wait until next winter. In the meantime I have some other nice images. There was one visit to the current lava flow. The flow really has been barely hanging on in the Royal Gardens area. There just isn’t a real good supply line to the tube system, so it seems. Minor deflation’s easily kill the flats flows.This is the longest I have ever seen a flow meander on the flats without getting to the ocean. It’s not at all surprising either. I only bothered taking a few images. One with the crescent moon rising over the flow and most right at sunrise. They are so detailed its phenominal. These D800 shots can print to the size of a huge wall with no loss of detail. This camera has changed everything in digital photography. The only people I hear knocking it are the ones who can’t get one. Bought mine locally at Kona’s Lighthaus Camera. If your ever in Kona stop in for your photography needs. Publishers take note, these images can go huge. I’ve also been shooting lots of video since last year but, no time to edit any of it. I have more than 400gbs waiting for me to edit. I think its going to be a while before it happens. 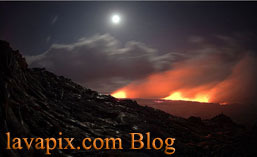 Some of the new images will be in my display at Sunday’s Kona Stroll. I say some because many I ordered didn’t arrive in time. They will be in the Kona shops by this week. The release of my new html5 website has been indefinitely delayed until the company with the software set up makes some very important changes. One is for my gallery thumbnails to show the correct image orientation and not squares. Hopefully they get this changed this year before everything I did is outdated. Stay tuned….. When visiting one of the galleries below, open an image and click on the keyword “d800” to view all D800 images on my website. As always feel free to comment on this post or any of the images. Your feedback is always welcomed. Forgot to mention you will notice my new blog. 5-14-12 Lava A visit to the meandering pahoehoe lava flows with my Nikon D800. 5-11-12 Pololu Valley. Went for sunrise. It was brief but, nice. Valley was clear most of the day. New No Trespassing signs. Seems to be the theme for this island lately. Might do a post on that subject soon. All text and images are copyright protected ©Bryan Lowry/lavapix.com. Use without my permission is prohibited. All rights reserved.